From The Telegraph. 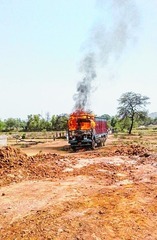 A sand mining truck on fire. In May 2017 villagers in Jatpura, about 260 km from Jharkhand state capital Ranchi, tried to stop workers from lifting sand from a river bed. There was a clash with several deaths. In one of multiple incidents in India because of sand mining in rivers , on 19th May 2017 there were reports that villagers in Jatpura, about 260 km from Jharkhand state capital Ranchi, were trying to stop workers from lifting sand from a river bed, and that there had been a clash with several deaths. According to police, the villagers were opposing the sand mining in Jatpura village in Garhwa. Sanjit Singh, who had been awarded the sand mining contract, allegedly opened fire at the villagers. In the firing, three members of a family were killed . In retaliation, the angry villagers allegedly killed one of the contractor's workers by dragging him out of his house and beating him to death. They also set fire to at least 12 trucks, an SUV, motorcycle and two JCB machines . The Telegraph  reported on May 21, 2017 that Garhwa deputy commissioner Neha Arora said the administration would initiate legal action against the contractors for using JCB machines to lift sand. "Two JCB machines were found on the spot yesterday, which the villagers had burnt. The district mining officer has been asked to initiate a legal action against the contractors," she added. On the 19th, around 30-40 residents of Jatpura village objected to contractors Dharamver Singh, Sanjeev Singh and their men collecting sand from the ghat using a JCB machine, which they claimed was leaving behind craters on the riverbed and making it flood-prone. A local source blamed the poor administration for the violence. Villagers have been protesting against use of JCB machines for long. But neither police, nor the district mining department have ever paid any heed. Had they been proactive, yesterday's clash could have been averted" . In India, by some estimates, the amount of sand used for construction has tripled since 2000. Demand is expected to keep soaring. “Demand for sand outstrips that of any other raw material,” says Sumaira Abdulali, the convener of the Awaaz Foundation, an activist group that campaigns against illegal sand extraction. “Developers” are turning to more remote regions to source it, bringing them into conflict with smaller, usually vulnerable, communities. Groundwater shortages, flooding, and depletion of fish and other animal life often follow in the wake of unsustainable sand mining, which can also weaken bridges and barrages along the path of heavily mined rivers, leading some to collapse. Unknown is the toll of the hundreds of conflicts erupting in small communities across the country between those who hold mining leases and local residents. “But we know the violence is extremely widespread,” Abdulali told The Guardian. In Jatpura, the sand miners arrived at the beginning of 2017, using excavators and industrial vacuums that could slurp vast quantities of sand from the riverbed. Niranjan Yadav led the opposition to the project. The mining was veering close to a patch on the banks of the river which is a cremation ground. The dredging also made the river treacherous. Holes began to appear beneath the surface, sometimes 20ft deep. Villagers said that in April 2017, weeks before the Yadavs confronted the miners, a 12-year-old boy had died in a hole in the river. Resentment grew. “People who are in distant areas, rich people – like a mafia – are becoming richer,” says another Jatpura resident, Sudama Ram. “We feel very helpless. But we have our brothers with us in the village. The whole village is with us. We are fighting.”. Satinder Singh was a manager from a nearby village who oversaw the sand mining in Jatpura and other sites. After the Yadav men were shot and the alleged gunmen fled, he remained close to the river “to keep watch”, according to Neha Arora, the deputy commissioner for Garwha. Officers found him beaten to death, and the house he had been renting in Jatpura razed. Police believe that he was attacked by a mob, “but it’s difficult to pinpoint who was involved,” Arora says. “Nobody is talking.”. The shovel of one of the excavators is still half-buried in the sand, as if its owner fled in a hurry. Several other vehicles are strewn about the site, warped and gutted by fire. The mining licence for Jatpura was held by Dharambeer Singh, a small contractor from a nearby district. His lease permitted him to mine sand close to the cremation ground, but not to use heavy machinery. “The [contractors] are target-driven, profit-driven,” Arora said. The shooting in Jatpura triggered protests in Garwha town and was raised in the Jharkhand state assembly. Lifting sand is now permitted only from large rivers, which officials say can be mined more sustainably. The river by Jatpura, classified as medium-sized, is out of bounds, Arora said . She is unsure why the use of heavy machinery, among other legal breaches, continued in Jatpura for months without officials being alerted. Corruption is also a consequence of the vast demand for sand: as well as environmental degradation, soaring sand prices encourage corruption and spark conflicts within villages . Project Details Sand mining by relatively small contractors using heavy machinery (JCBs) in local river called Banki in Piprighat, Garhwa district, Jharkhand leading to complaints by villagers. Why? Explain briefly. Sand mining has not stopped in the area, in the village of Japura it stopped. There are several court cases pending because of deaths. - Villagers, contractors up the ante. Our Special Correspondent. 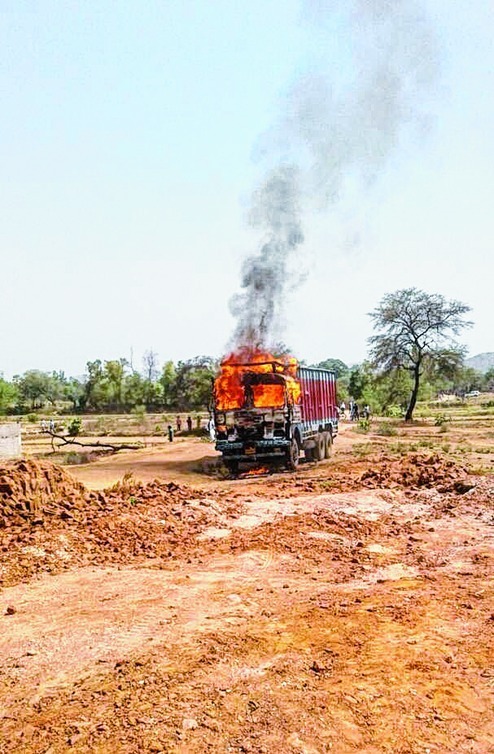 (2) Three killed over sand mining dispute in Jharkhand. IANS. Ranchi. (7) Three of family gunned down in Garhwa district of Jharkhand.